(June 5, 2009) The Catawba Riverkeepers need more eyes and ears in the Steele Creek community to help reduce the amount of sediment that enters area streams and creeks and eventually causes harm to Lake Wylie. They are conducting Muddy Water Watch Training at CPCC's Harper Campus (315 Hebron Street) to train volunteers in identifying and reporting violations and to introduce community volunteers to sediment and erosion control enforcement officials. 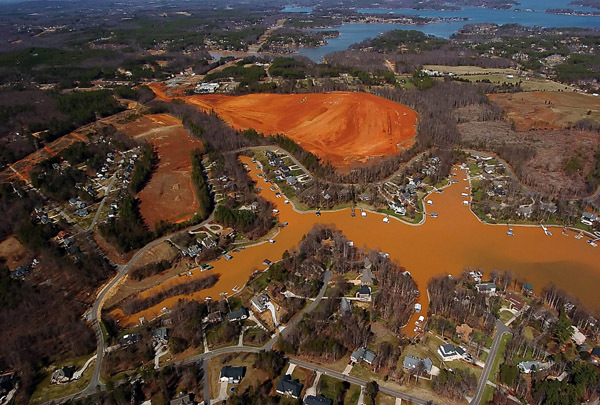 If you've been dismayed at the amount of sediment leaving upland construction sites and at the resulting changes in the color of creeks, streams, and Lake Wylie after a rainfall, there is something that you can do to help! The first session of their four-session class was held on Thursday, June 4. Because only one of the seven volunteers who attended was from the Steele Creek community, the class is in jeopardy of being canceled unless they can meet enrollment requirements. With the amount of development in the Steele Creek area, there certainly should be more people interested in helping protect our natural areas from sediment, the leading cause of water pollution. Not only does sediment smother fish beds and interfere with macro invertebrate reproduction (fish food), but it also seriously impacts site feeding water birds. State and County enforcement officials welcome your help. They are understaffed and do not have enough inspectors to cover the massive amount of development, even in the slowing economy. Many construction sites are not being maintained and, in some cases, are being abandoned altogether. That is why help is needed from the Steele Creek area. The workshop is fun, easy, quick, and most of all, it gets results! Please join the Riverkeepers for the three remaining classes. The training is free, and they'll offer a CD of the first class for those who would like to join the second class on June 11. It's not too late!!! Please contact Pam Beck, Muddy Water Watch Coordinator at 704-827-8351 or Pam@catawbariverkeeper.org BEFORE NEXT WEDNESDAY if you have questions, and to preregister for the class. If they do not meet their attendance requirements by then, they will not be able to continue the class. Lake Wylie and the Catawba River need your help to protect our natural resources. For more information see the Muddy River Watch or the Catawba Riverkeeper Foundation web sites. What is Muddy Water Watch (MWW)? Who is involved in MWW? In North Carolina, MWW is sponsored by the 7 North Carolina Riverkeepers®, including the Catawba Riverkeeper®. We also are partnering with Southern Environmental Law Center, Conservation Council of NC and other water shed groups across the state to help stem the tide of sediment— NC’s #1 water pollution problem—from further impacting our rivers, streams and drinking water supplies. Volunteers from all over the state will be trained by the Riverkeeper in their watershed to help improve compliance with the NC Sedimentation Pollution Control Act. CRF is conducting a class on how ordinary citizens can help enforce the erosion and sedimentation control rules. Our upcoming trainings will take place on June 4, 11, 18 and 25 from 6:30-8:30 at CPCC's Harper Campus, Rm. 301, at 315 Hebron Street in the Steele Creek area. How do I learn more about MWW? For additional information or to sign up for the January training session, please contact Pam Beck pam@catawbariverkeeper.org at the Catawba Riverkeeper Foundation (704-679-9494). It is not necessary to sign up before the classes begin, but it would help us make sure we have enough materials for everybody if you sign up in advance. To learn even more about MWW, visit www.muddywaterwatch.org. Here, you will find additional descriptions, contact information, training dates at other locations, training materials, and much more.